Dr. Jason Lisle is researcher on staff at Ken Ham’s Answers in Genesis, who writes the forward to the book. It is printed by Master Books, Green Forest, AR, 2009 and is in its sixth printing in 2015. This is more of a book on logic, reasoning, and debating than on creation itself. 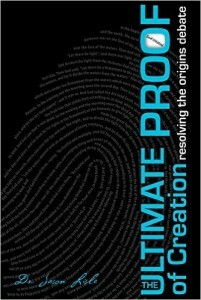 Lisle goes through ten chapters from proposing his “ultimate proof” of creation from the basis for reasoning at all, to evidences, logical fallacies, apologetics, and examples he used in actual debates with critics. Interestingly, Lisle is much more a presuppositionalist than an evidentialist, and is attempting to base evidences for creation on the presupposition that the Bible must be accepted before we can understand anything anyway. In the first three chapters he proposes what he calls “preconditions of intelligibility.” These are those things that all human beings take for granted when making any kind of argument. Lisle regularly emphasizes basic laws of logic, uniformity in nature, human memory, and morality as examples of those things we naturally assume when arguing anything. He then moves on to the “AIP” test for challenging any argument: Arbitrariness, Inconsistency, and Preconditions of Intelligibility, showing that most false arguments violate one of these three presuppositions. Lisle also has an interesting application of Proverbs 26:4-5, “Answer not a fool according to his folly, lest thou also be like unto him. Answer a fool according to his folly, lest he be wise in his own conceit.” We cannot agree to the unbeliever’s thesis (or we will be like him), but we can, for sake of argument, assume his thesis in order to show its fallacies (to confront him about his error). Combining a few statements made within a few pages, will give a taste of Lisle’s case for presuppositionalism. “The Bible not only provides criteria for itself, but does so for all other facts. It gives us a foundation (the biblical God) for rational reasoning (including the laws of logic), science, morality, reliability of our senses and memory, and so on. . . The Bible passes its own criteria for truth (it is consistent, non-arbitrary, etc.) and provides criteria for everything else. . . The Christian worldview is the only one that is actually able to authorize itself—to pass its own criteria while simultaneously providing criteria for everything else. . . Notice that even the standards by which all worldviews are judged are actually biblical standards. . . The ultimate proof of creation is not that people must profess the Bible—or even read the Bible to be rational. The argument is that the Bible must be true in order for rationality to be possible. Only the biblical worldview can make sense of rationality, morality, and science. And the biblical worldview has always been true, even before the Bible that articulates this view was inscribed” (pp. 158-160). The book is worth the time and money. It will give a different and interesting angle on the support for creation.